Rambo: First Blood Part II (1985). Possibly my favorite THORN EMI artwork and I see this cassette all of the time in usually good shape. My local has this one - I covet it. 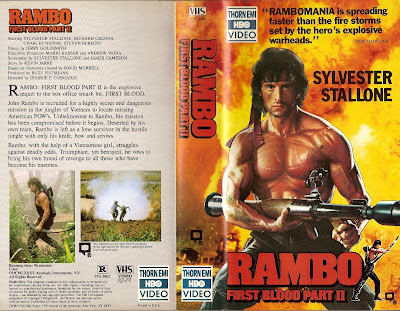 I love the artwork, but obviously doesn't beat First Blood (which is framed on my wall). That is a great cover, for a great sequel to a great movie! I love lil Rambo on the bottom left gettin' ready to jack some one up with an explosive arrow to the neck! i watched this and the new Rambo last night and all i can say is this movie still holds up. one of the BEST and the new one gets better and better everytime i see it. Rambomania indeed. Gore Gore, do you mean you have the Thorn EMI VHS art of First Blood framed? That would be sweet, I actually have a mint condition copy of Thorn's VHS, one of my absolute favorites. and the new Rambo was great wiec? Solid return to form at the end of the day.